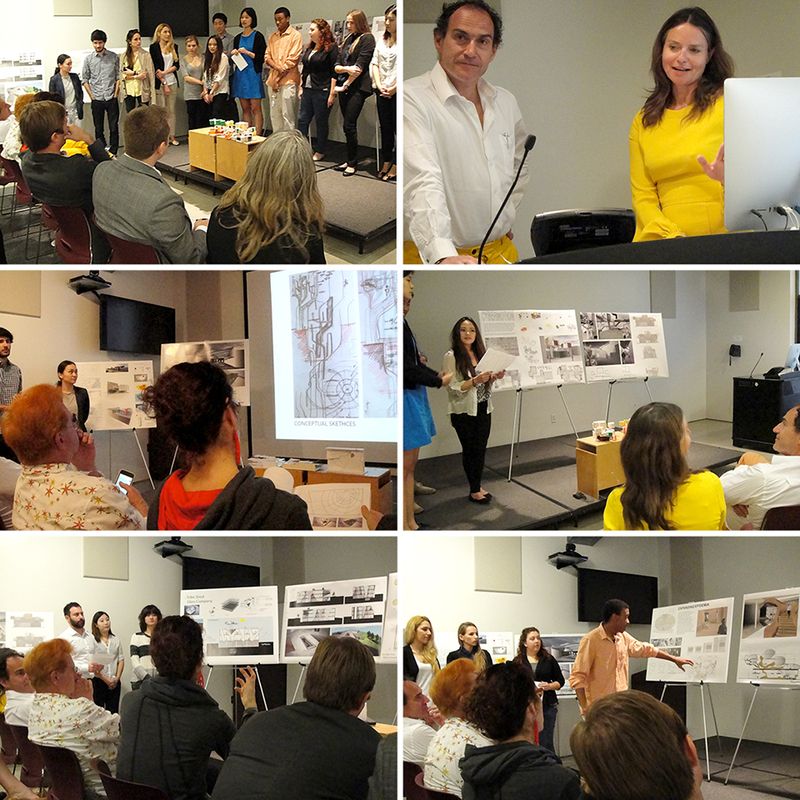 On March 19, 2014, Donghia students presented their collaborative one-week Master Class projects to a jury composed of: Benjamin Ball, Principal, Ball-Nogues Studio; Chava Danielson, A/L/I Adjunct Professor/Principal, DSH //architecture; Mark Mack, Professor, UCLA Architecture & Urban Design/Principal, Mack Architects; Ed Ogosta, Principal, Ed Ogosta Architecture; and Ingalill Wahlroos-Ritter, Associate Dean, Woodbury University School of Architecture/Principal, WROAD. Joep van Lieshout, 2013-2014 Donghia Designer-in-Residence, in collaboration with Caroline Prisse, directed fourteen Architecture/Landscape/Interiors students in a one-week, collaborative project in which they (as four teams) reconfigured the Tetterode Glass Studio in Amsterdam for a self-sustaining live-work community of the future, with its own industrial production and resources of energy, food, etc. All components and representations of the projects were produced between March 13 and 19 by Donghia students Thomas Acosta, Rodrigo Carmona, Dianna Gonong, Molly Hubley, Suna Jaen, Golnaz Noroozi, Merve Onur, Jusung Park, Sandra Sadauskaite, Izzy Savage, Jihae Shin, Julia Sieh, Ruishi Wang and Nyann Swain-Welborn. The Donghia Designer-in-Residency and Master Class at Otis College of Art and Design are made possible by a generous donation from the Angelo Donghia Foundation.